Graduate students and postdoctoral scholars make significant contributions to the dynamic research at the University of Louisville School of Medicine. The Office of Graduate and Postdoctoral Studies aims to help graduate students and postdocs maximize this pivotal state in their professional development. This office is dedicated to enhancing their experience. We invite you to explore the materials and information that pertain to you in the pages of this site. Please contact the office with any questions, comments, or ideas that you may have about graduate and postdoctoral studies at the University of Louisville School of Medicine. My name is Jason Gumbel and I’m a third year PhD candidate in the Anatomical Sciences and Neurobiology department. I grew up in Champaign, IL, which sounds way fancier than it was. Although I never received straight A’s, the subject of science was the only thing that could keep my attention long enough to get through the day. My mother teaches 6th grade science and was my first and most influential scientist. She taught me how much fun science can be through experiments ranging from the basic vinegar-baking soda volcano to constructing a functional elevator from Legos (fit for Lego people). I later received B.S. in Biology from Southern Illinois University where I started undergraduate research investigating the development of the embryonic mouse pituitary gland. After graduating, I moved to St. Louis to expand my experience by exploring the clinical field of non-Hodgkin lymphomas and leukemia research. Currently, I am studying the effects of spinal cord injury on the upper urinary system in Dr. Charles Hubscher’s laboratory. While my research experience seems as scattered as my desk, I’ve learned that research is without a doubt the career path for me. Apart from spending time in the lab, I enjoy activities like running, hiking, and heckling my friends while they play volleyball. Additionally, I enjoy napping on the couch and watching trashy TV shows. I’m currently involved in Science Policy and Outreach Group, where I enjoy volunteering in different science outreach programs, spreading the news of how exciting science is. My science icons and inspirations are my Mom, Dawn Grisley, Rosalind Frankin, and George Washington Carver. 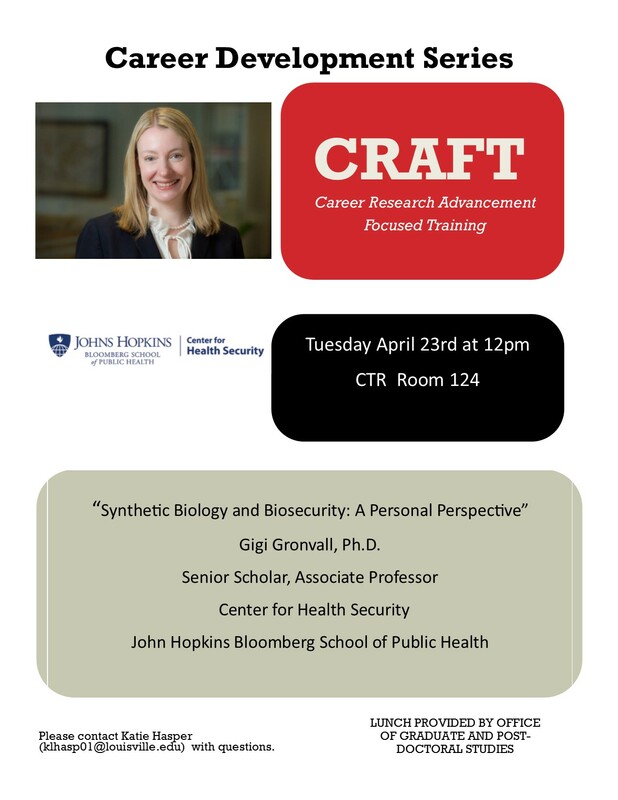 Dr. Gigi Gronvall presents her talk titled: " Synthetic Biology and Biosecurity: A Personal Perspective"
Our CRAFT Seminar Series was featured in a blog, written by Adriana Bankston, a former Post Doc.